It is a fact that Ghana’s top musicians are living the good life filled with luxuries and elegance. Many of Ghana’s successful artistes are living off their hard work and it is evident in the properties they are acquiring for themselves with their wealth. 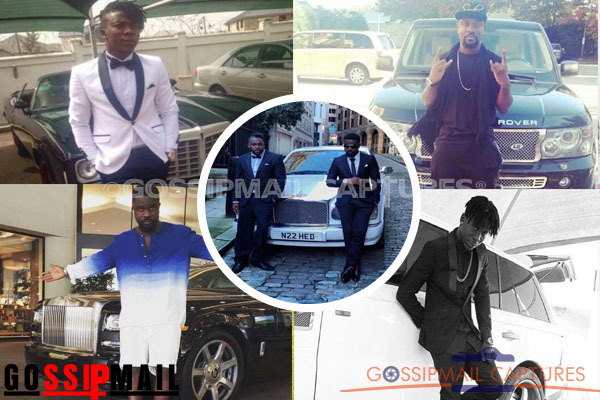 Today, GM Captures/ YEN.com.gh brings you the luxury cars of two of Ghana’s top acts, Sarkodie and Stonebwoy. These two artistes have won many local and international awards for their contribution to the entertainment industry. Sarkodie is arguably referred to as a king in terms of rap music in Ghana. The “Dangerous” song creator has been crowned the artiste of the year more than once. Sarkodie has a daugther fondly called Titi whose mother is his long-time girlfriend, Tracy. Sarkodie was recently caught in a web of controversy over lyrics of a song titled "Jennifer Lomotey"
[next] Stonebwoy, known by the real name, Livingstone Etse Satekla is the CEO of BHIM Nation. The artiste has been recognized both on the local and international fronts for his dancehall music. Stonebwoy recently tied the knot with dentist fiancee, Louisa Ansong in a private wedding ceremony attended by many celebrities. [next] The “People Dey” hit maker was recently nominated for the Black Entertainment Television Awards. The dancehall artiste missed out on an award to Nigeria's Wizkid after both of them along with other African artistes were nominated by BET.